Pictured are the two William Floyd 7th & 8th Grade Bellport Youth Summer League basketball teams who played in the championship game against each other. 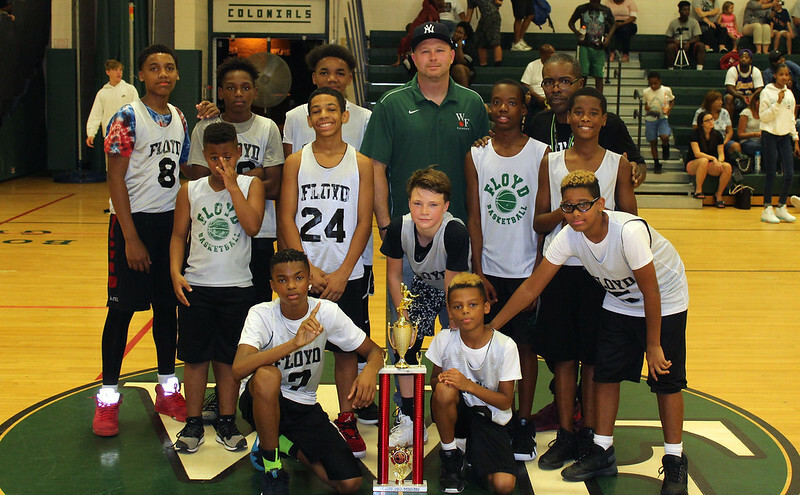 The William Floyd basketball program saw tremendous success during this year’s Bellport Youth Summer League season with seven teams competing in grades three through 10, four of which reached the title games in their respective divisions and two teams the 5th & 6th Grade team along with one of the 7th & 8th Grade teams – taking home championships. The William Floyd 5th and 6th Grade Bellport Youth Summer League basketball team won the championship in their age group. Live game situations, as opposed to simulated games, provides the student-athletes the in-game experience necessary to help bring their skills to the next level. “The biggest area of improvement has come on the defensive side of the ball as we were able to hold teams to lower scores,” added Coach Sumpter. Boys’ varsity head coach Rob Hodgson also plays a key role during the summer league. Hodgson directs each coaching staff and observes the student-athletes competing to learn about the up-and-coming talent as well as each student-athlete’s strengths and weaknesses before they get an opportunity to play at the varsity level. Congratulations to Coach Sumpter, Coach Hodgson and all the student-athletes who were involved in the success of William Floyd’s 2018 summer basketball season. Special thanks to the coaches and volunteers who helped guide each team for a successful and fun season! 3rd & 4th Grade (Coach Darrell Sumpter); 5th & 6th Grade (Coach Darrell Sumpter and Jay Johnson) 7th & 8th Grade Team 1 (Coach Darrell Sumpter and Lamarr Wooten); 7th & 8th Grade Team 2 (Coach Darrell Sumpter and Lamarr Wooten); 7th & 8th Grade Team 3 (Coach Daymond Dawson); JV 9 (Coach Dejiah Sumpter and Shawn Piazza); and JV 10 (Coach Darrell Sumpter and Lamar Wooten). Additional photos are available in the flickr album below!